WE have, unfortunately, no detailed description of the outward appearance of an ancient city. We are told of lofty walls, and strong ramparts with buttresses and watch-towers and great gates; the whole surrounded by a moat or even a double moat, one of water and one of mud. 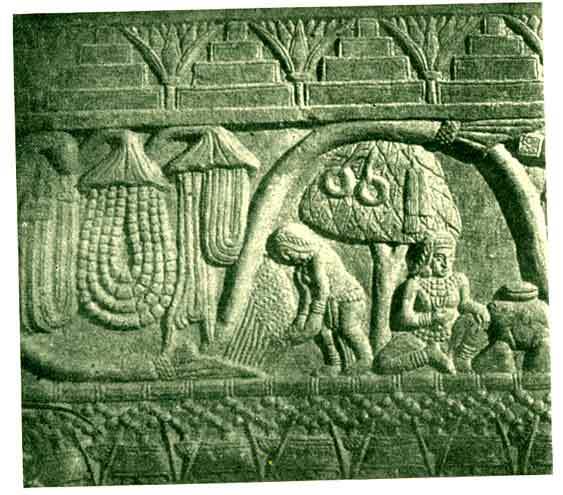 In a bas-relief on the Sanchi tope, dating from the second or perhaps the third century B.C., we have a representation of such city walls, and it is very probable that in earlier times the fortifications were often similar in kind. But we are nowhere told of the length of the fortifications or of the extent of the space they enclosed. It would seem that we have to think, not so much of a large walled city, as of a fort surrounded by a number of suburbs. For there is frequent mention of the king, or a high official, going out of the city when he wants to take an afternoon's pleasure jaunt. And from the equally frequent mention of the windows of the great houses opening directly on to the streets or squares, it would appear that it was not the custom to have them surrounded  by any private grounds. There were, however, no doubt, enclosed spaces behind the fronts of the houses, which latter abutted on the streets. 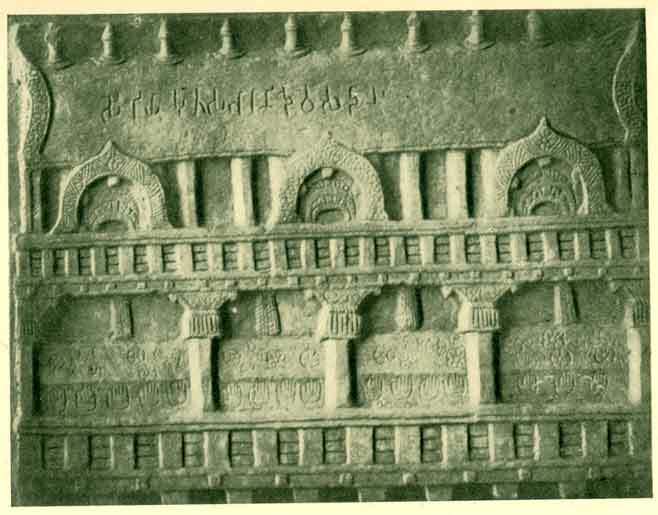 reliefs showing the general design of the frontage. 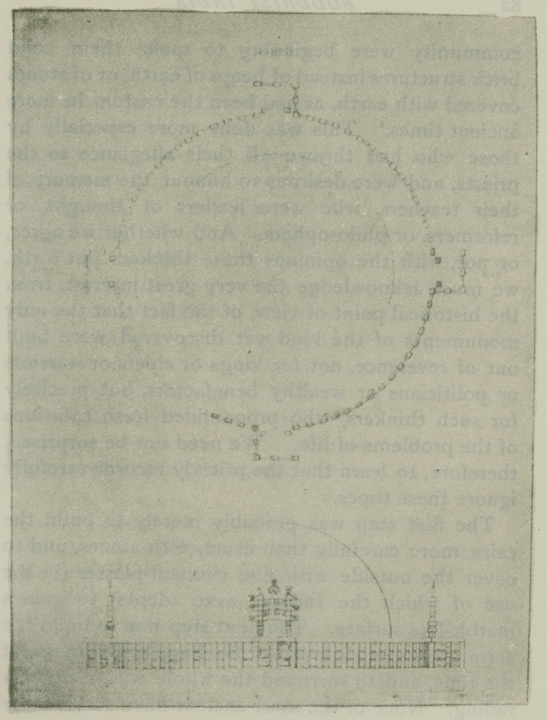 The elaborate description of the underground palace, a sort of Welbeck Abbey of ancient days, constructed by Mahosadha in his famous tunnel, is full of points of interest in this connection. And the detailed account of the residences of members of the Order given in Vinaya Texts (3. 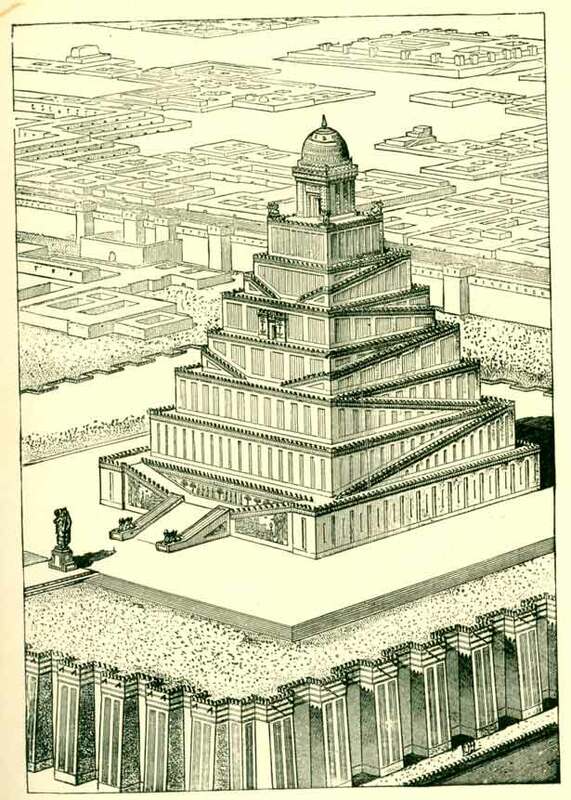 96, 104–115, 160–180) goes farther into minute details of the construction and ornamentation of the various portions of a human habitation. Then we have descriptions and bas-reliefs of the palace of the gods. And as gods are made in imitation of men, these are fair evidence also of the buildings in use by men at the time when the books were written, or the sculptures made. We have no space to enter fully into detail here. 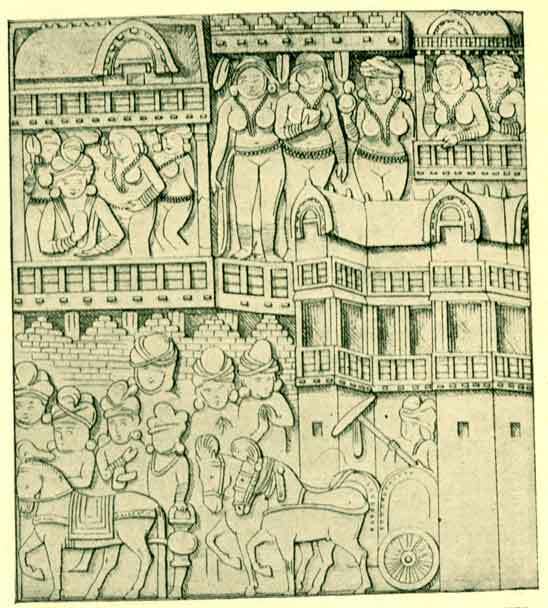 But the annexed illustration shows the ideas of a sculptor on the Bharahat tope as to the facade of a mansion, and the next shows his notion of what the meeting-hall of the gods, part of Vejayanta, the palace in heaven, was like. books referring to this earlier period, there is no mention of stone except for pillars or staircases. A palace of stone is only once mentioned, and that is in fairy land. We must suppose that in earlier times the superstructure at least, of all dwellings was either of woodwork or brickwork. In either case it was often covered, both internally and externally, with fine chunam plaster-work, and brilliantly painted, in fresco, with figures or patterns. Elaborate directions are given in the Vinaya for the construction of this smooth plaster basis on which the frescoes were painted. And the names of four of the commoner patterns have been preserved. They are Wreath-work, Creeper-work, Five-ribbon-work, and Dragon's-tooth-work. When figures predominated the result is often called a picture-gallery (cittagara). And though we cannot suppose that the art had reached the perfection afterwards attained in the Ajanta frescoes, the descriptions show that it had already advanced to a stage far removed from the early beginnings of pictorial ornamentation. answered the purpose at once of a drawing-room, an office, and a dining-hall. In the king's palace there was accommodation also for all the business of the State, and for the numerous retinue and the extensive harem. We her of no offices, in which the business of the naion could be carried on, outside the palace. And he supplementary buildings included three institutions which are strange to us, and of considerable historical interest. We are told several times of a building of seven stories in height - a satta-bhuumaka-pasada. No one of these has survived in India. 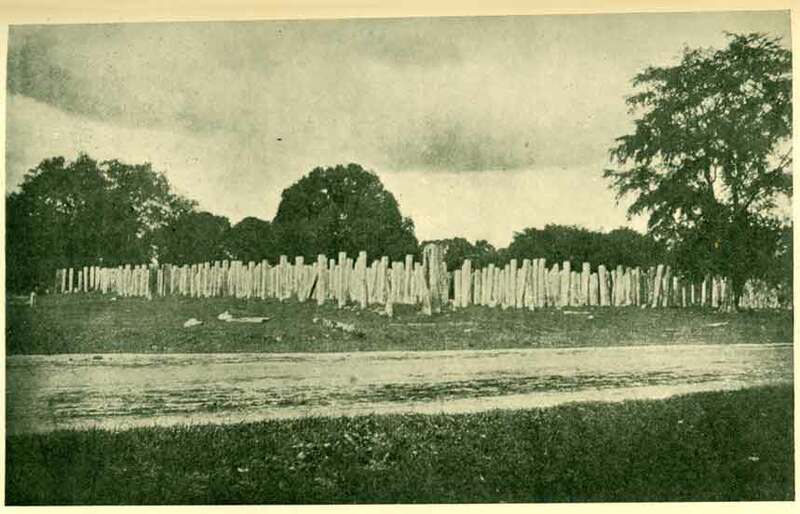 But there is one of later date still standing at Pulasti-pura in Ceylon; and the thoasand stone pillars on which another was erected in the second century B.C. at Anuradhapura form one of the most interesting monuments of the same island. It seems almost impossible to avoid the conclusion that these curious buildings were not entirely without connection with the seven-storied Ziggarats which were so striking a feature among the buildings of Chaldæa. We know in other ways of connections between the civilisation of the Ganges Valley and that of Mesopotamia; and it would seem that in this case also the Indians were borrowers of an idea. But in India the use to which such seven-storied palaces was put was entirely private, and had nothing to do with any worship of the stars. Fig. 7. - Ancient open-air bath at Anuradhapura (NO. 2). private grounds of the rich. Several very ancient ones are still to be seen at Anuradhapura in a fair state of preservation in spite of the more than two thousand years that have elapsed since they were first constructed. But the great houses must have been few in number. There was probably a tangle of narrow and evil-smelling streets of one-storied wattle and daub huts with thatched roofs, the meagre dwelling-places of the poor. And we must imagine long lines of bazaars, the shops (without windows, of course, and indeed with very little wall on that side) open to the streets, and mostly devoted, in the same street, to the sale of wares of a similar kind. 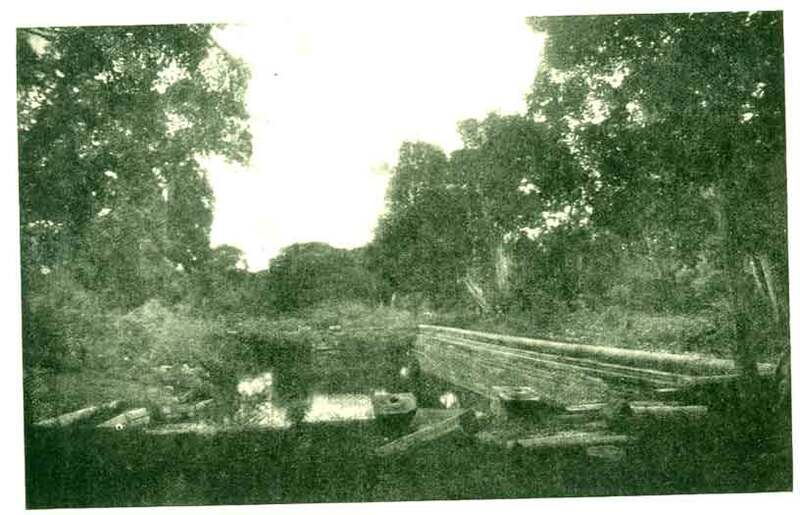 Fig.11 - The Split Rock. 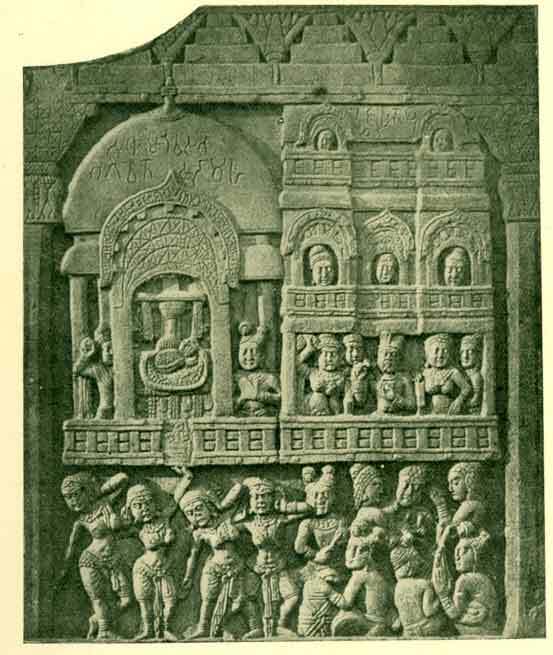 Gambling Scene From The Bharahat Tope. Crowded the city must have been, and noisy. The oldest records boast of the fact, and we are not surprised to learn that a corner house, abutting on two streets, was highly prized. But the size of the few large cities is represented as so large, including the suburbs, that the crowding and noise were less probably in those days, at least outside the fortifications, than they are now. So far as the records at present show there seem to have been few sanitary arrangements. There is constant mention of drains; but they are for water only - either small ones to carry off the water from a bathroom or a chamber, or large ones to carry off the rain from within the fortifications. It was through these last that dogs and jackals got into the citadel; and sometimes even men used them as means of escape, at night, when the gates were closed. It is not likely that they at all corresponded, therefore, to the Roman cloaca. On the other hand the at present obscure arrangements to obviate the various sanitary difficulties arising from the living together of a number of members of the Order render it probable that in the palaces and larger mansions, at least similar arrangements may have been in use. public teachers, were cremated; and the ashes were buried under a so-called tope (in Pali thupa, in Buddhist Sanskrit stupa). But the dead bodies of ordinary people were disposed of in a unique way. They were put away in a public place (sivathika or amaka-susana, both of which, for want of a better word, are usually translated cemetery). There, as a rule, the bodies, or the remains of the pyre, were not buried, but left to be destroyed by birds or beasts, or dissipated by the process of natural decay. This spot was also used as the public place of execution especially by impalement. It was quite open to the public. But as we can readily understand, it was believed to be haunted; and was only frequented by the more austere sort of ascetics. community were beginning to make them solid brick structures instead of heaps of earth, or of stones covered with earth, as had been the custom in more ancient times. This was done more especially by those who had thrown off their allegiance to the priests, and were desirous to honour the memory of their teachers, who were leaders of thought, or reformers, or philosophers. And whether we agree, or not, with the opinions these thinkers put forth, we must acknowledge the very great interest, from the historical point of view, of the fact that the only monuments of the kind yet discovered were built out of reverence, not for kings or chiefs or warriors or politicians or wealthy benefactors, but precisely for such thinkers, who propounded fresh solutions of the problems of life. We need not be surprised, therefore, to learn that the priestly records carefully ignore these topes. The first step was probably merely to build the cairn more carefully than usual, with stones, and to cover the outside with fine chunam plaster (in the use of which the Indians were adepts) to give a marble-like surface. The next step was to build the cairn of concentric layers of the huge bricks in use at the time, and to surround the whole with a wooden railing. None of the most ancient have survived, or been explored sufficiently to enable a restoration to be drawn. But we can tell very much about what they were from the later examples. 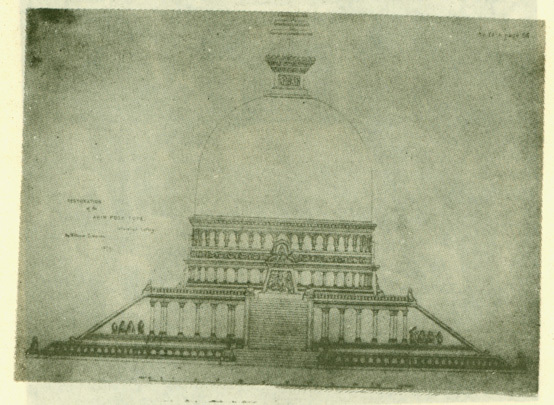 This, for instance, is Cunningham's plan and restoration of the famous Bharahat Stupa. And among the bas-reliefs carved on the stone railing are several topes as the sculptor of the day imagined they ought to be. narrow space he has to deal with, has allowed himself to give a disproportionate height to the ornamentation at the top of the dome. has yet attempted to make a restoration of one of these of the most ancient date. But Mr. W. Simpson has given us one of later date, and this is here appended for the sake of comparison. 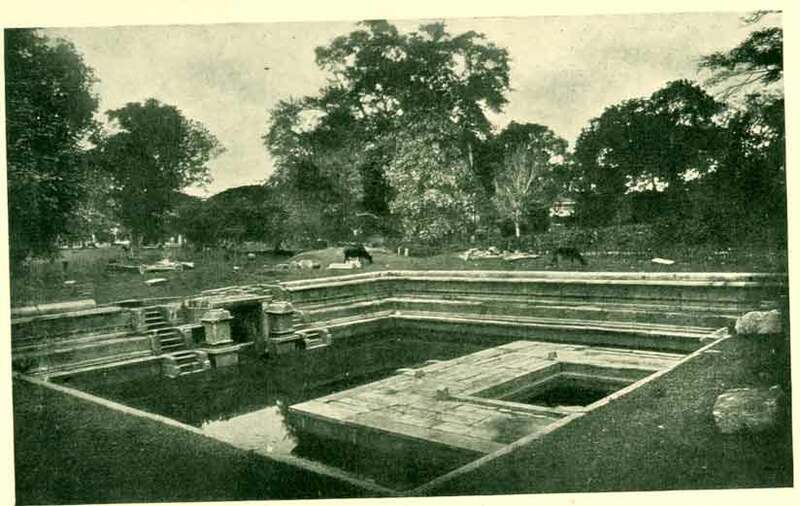 This dagaba itself dates from the third century A.D., but the large irrigation "tank" shown in the foreground is probably the oldest dated one in India, as it was constructed before the time of Asoka. Jat. 6. 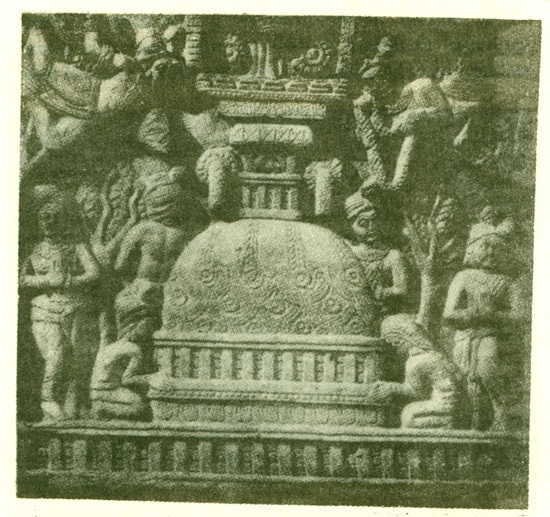 430; translated in Yatawara's Ummagga Jataka. These gods must have been made by the clansmen in the free republics, or they would not have had a mote-hall. Translated in Vinaya Texts, 3. 170–172. Vin. 2. 67; 4. 47. Jat. 1. 227, 346; 4. 378; 5. 52, 426; 6. 577, etc. This illustration (see Fig. 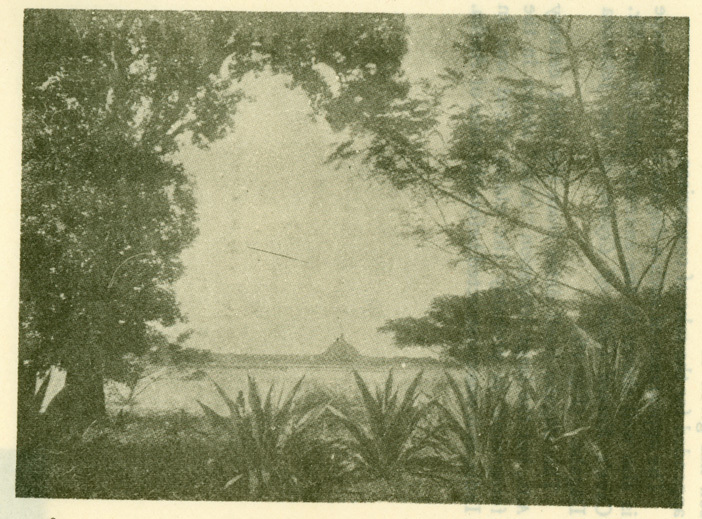 9) from Mr. Cave's Ruined Cities of Ceylon (Plate XIII.). This beautiful volume ought to be in the hands of every Indian archæologist. Comp. 1. 290; 3. 91. See the translation in my Buddhist Suttas, pp. 262, foll. Rh. D. Buddhist Suttas, 248, 249. Vinaya Texts, 3. 108, 110. Jat. 1. 425; 3. 415. Vinaya Texts, 3. 155, 298. D. 2. 295–297; Jat. 1. 264; 3. 330; 5. 458. Jat. 4. 29; 6. 10. White Yajur Veda chap. 35. See Mr. Peppé's measurements in the J.R.A.S. for 1898. The present state of the ruins of this important monument is shown in the above Fig.